I’ve been having some difficulty getting walks in for the last few days. I was supposed to do this walk yesterday, but an electrician’s visit to fit two wall lights and do a few other, apparently minor things turned into an epic all-day visit by three electricians and their little mascot who did the running around, used the vacuum cleaner and had the mickey taken out of him by the others. Its all done now, short of paying the bill, so I bundled superdawg into his travelling harness thingy that smells of wet dog and went via crook co-op for some precious things to eat on a walk. 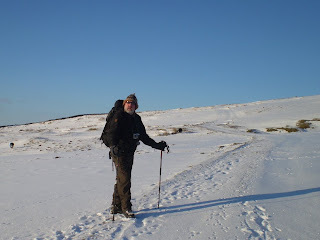 My TGO Challenge training programme says that I should strive to walk a 14 mile walk in February (16 miles in March) – and I thought this one was 14 miles. I’ve done this walk several times before, with minor variations. I was sure it was 14 miles. Turned out to be 13.4. doh! Near enough, though, I suppose. On this walk I was also trying out several new things. New thing number one – a “thermal tee shirt” price £3 from the pound shop. 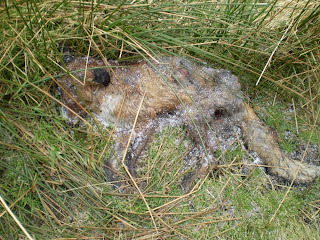 Actually, they’ve loads of these and in reality, they’re base layers. And rather good ones too. I shall buy a few more. New thing number two – some hi-tec walking boots £30 at the Original factory Store – shudder been £60. very comfy, apparently waterproof (at the moment), light, springy and a bargain. 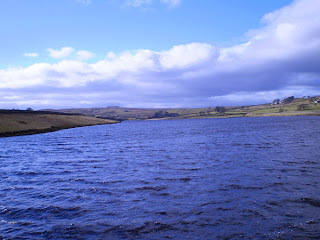 (Note that the walk took place on the Pennines, which are always soggy) Are they robust enough for a TGO Challenge, though? I shall try to find out by treating them badly and walking through soggy peat and wet snow. This may lead to their downfall in terms of remaining useful as a boot…..
New thing number three – as recommended in a breakfast thread on the TGO challenge forum – a Jordan’s superfood bar. Quite nice. I liked it cos it has no added salt. I don’t do salt. Tracy, the cardiac nurse wags her finger at salt. And a blueberry muffin for the fun. 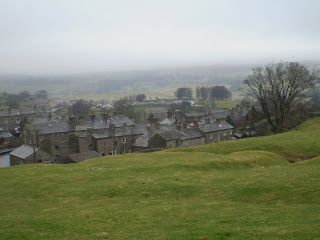 And so, on a driech Wednesday, we eventually pitched up at the ropemakers car park in Hawes. An unpromising start in drizzle, hill fog and a “fresh” wind which had me Paramoed up from head to foot to fingers. We plugged our way up through the rough pastures and along an off-road-motorbike trashed bridleway to the top of Drumaldrace. The location of the summit appears not to be at the point containing the summit cairn by the way – but such is often the way with yer peaty lumps. This hill has a ring of deep shakeholes, all of which were full with old snow. This cheered up the dog no end – almost as much as being accidentally locked in the kitchen with a beef joint would….. I went all the way around to the Roman road before climbing to the top so that I could have the wind behind me. 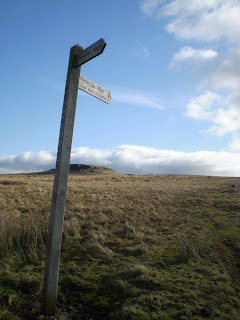 Onwards – In brightening weather with a lifting cloud base, we doddled off into a perishing headwind along the Roman road towards Lancaster for several miles till we came to the Pennine Way, at which point we turned back towards Hawes, bagging the top of Dodd fell Hill on the way. The wind started to get its act together at this point and whilst I was merely being blown sideways, superdawg was actually in flight at times – though he does tend to leap along. The leaps were much longert than expected and he wasn’t landing where he expected to land. 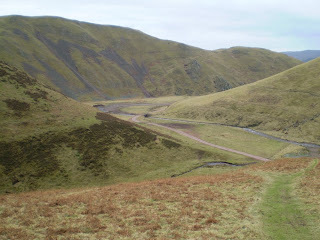 The walk became a struggle till eventually we dropped down below the lee of the hill. Half a mile short of the 14 miles I should have done. The headwind made up for it, though. Hard work at times. 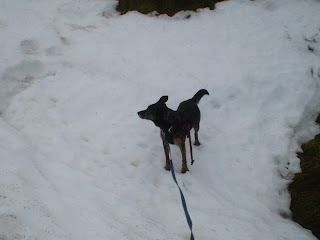 Bruno enjoyed the old snow drifts and the short flights. I enjoyed the blueberry muffin and the view of Whe****de. I’ve been busy being a landlord over the last week or so… I’ve got the land to lord over anyway…. Other things are still up in the air. So, I was pining for the moors and decided it was about time for a little jaunt. I took both dogs – Bruno, whom readers will have met before and Tammy, who enjoys throwing up all over the car seats. She managed to throw up a meal provided to her ten hours earlier. What on earth was she saving that for, I wonder? So anyway, we went to Baldersdale. 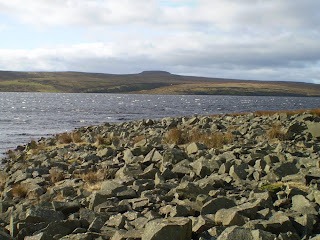 Baldersdale has three reservoirs, loads of car parks and permissive paths, Hannah Hauxwell’s meadows and a couple of mesa-like gritstone lumps – one Shacklesborough and the other Goldsborough. There were a few early spring rock climbers playing on the rocks. One lass turned up with a male partner and she had, what appeared to be a mattress strapped to her back. Goldsborough, by the way, was the stamping ground of one Bentley Beetham who was a teacher at Barnard Castle School. 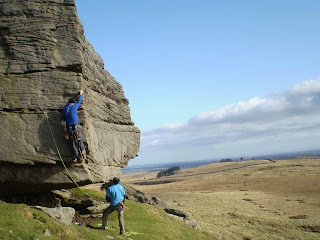 He used to bring pupils up here for rock climbing. Bentley Beetham is responsible for pioneering a bunch of long, easy scrambles and rock climbs in the Lake District. Cam Crag Buttress is one of his, for instance. Grade 2 Scrambling - just about Moderate and about 600 feet long. Cracking route. And then on to Low Birk Hat, where Hannah Hauxwell eked out a Spartan existence and, which is now a nature reserve. Hannah’s meadows had more pregnant sheep grazing. These meadows are absolutely heaving with Northern Meadows plants from just after lambing time in April, through to haymaking in late July. 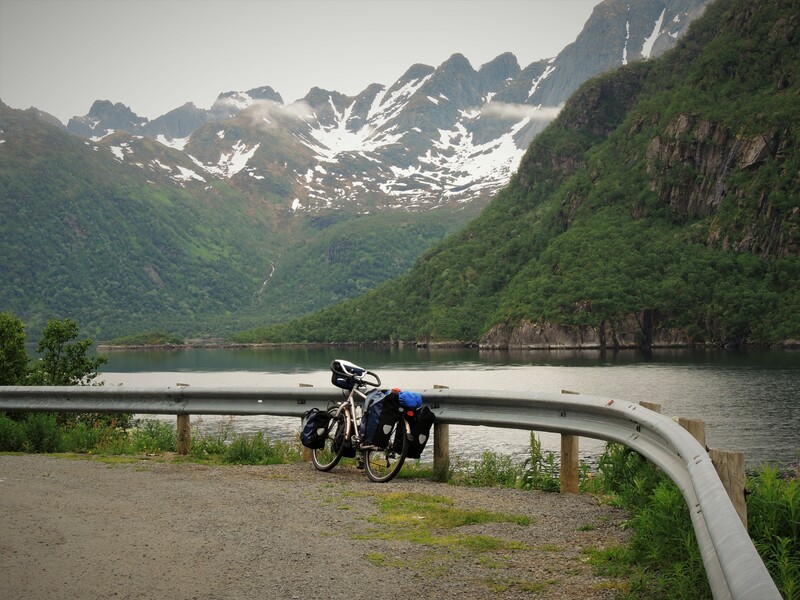 Bring your wild flowers book and a ticking pencil. Poor Tammy was getting a bit fragged by this time (she’s getting on in years) and so, we made short work of getting back to the car for a quick journey home for a cup of tea and a chewstick. Just 6 miles or so. More walkies in a day or so, for my TGO Challenge training plan which says that I ought to walk at least 14 miles on a walk in February. "The last PS" sounds like a 1960's Everly Brothers song.. Probably E, A and D with a middle 8 in Bm. Anyway - My wife has just returned from a visit to her dad in Halifax and, as she does on some occasions, she came back to Durham by our favourite route through Skipton and the Yorkshore dales (8 miles shorter than the motorway and, generally more fun). And, as she does sometimes, she came back with a copy of the Craven Herald and Pie-on-Ear. It would appear, from reading this paper, that two days after me and Mike climbed up the patch of snow, some poor lassie fell down it and ended up with a head injury and cracked ribs. It would seem that she fell doen the bit we'd climbed up. Anyway, I hope she's all right. and there was a little bit of discussion about it which ultimately came to a sort of conclusion that the particular wreckage was most probably that of a Mosquito which came to grief on 13 December 1948. One of the posters - a chap called Pete, had talked to the keeper who had been first on the scene. I don't deliberately seek out aircraft wreckage, but wanderers in the Pennines and, indeed on most UK hills will often come across undercarrieges, bits of wings, engines, wiress and all kinds of detritus. Back to Great Whernside - apparently there were at least another three crashes on it during WWII - a Halifax, a Whitley and a B17. 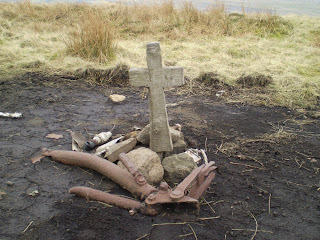 There's also a well-known memorial to Polish airmen who died on the neighbouring Buckden Pike. Its an awful toll. It would seem that aviation in WW2, and, shortly afterwards, was a highly dangerous business, notwithstanding anything that enemy action might add. The Halifax crash in particular was one of several that failed to return from a navigation training exercise on the same night. Its all very sad and these sites deserve respect for the people who perished. These could be the last snowy ones till next Christmas unless I can drag myself up to Scotland - nearly went a week or so ago... but didnt. But soon. I think they're fab anyway. 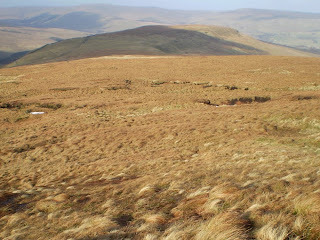 But this is Whernside...y'know - the Three Peaks Peak. 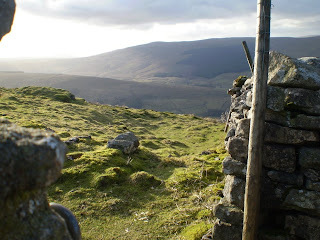 Its not somewhere up yer Cairngorms, its Whernside. Whernside!!!!! Anyway, I like the pic cos I look a bit relaxed and the snow looks a bit pure and white and cosy somehow. Somebody posted on the TGO Challenge forum website thingy that they'd just booked some train tickets. So, despite a distinct current lack of spondoolies partly due to an outrageous gas bill... I decided I'd better book some transport too. One thing you have to do with any skill is to practise. Practise practise practise. And so, I steered the knipemobile to the layby quite near to Ribblehead to meet Mike from Go4awalk again for a bit of ice axing. 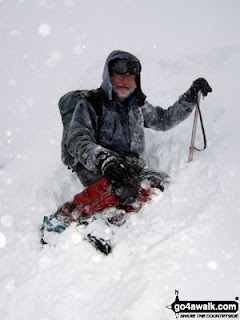 The idea was to find a slope, slide down it in various positions, several times until tired and wet – and, incidentally, whilst trying to stop oneself sliding down the slope. 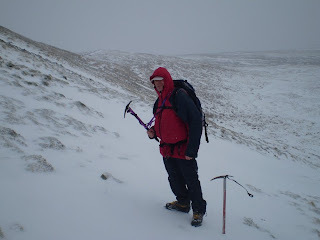 And then climb Whernside. 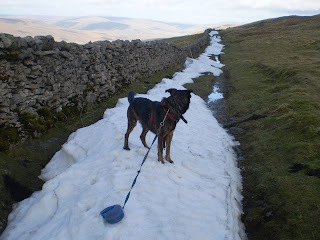 Unfortunately, there wasn’t a lot of snow at Ribblehead. 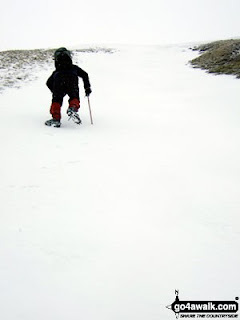 There was a lot of ice, but any snow seemed to be high up on the slopes. There was a fair bit on Ingleborough, but I just been up Ingleborough, see? 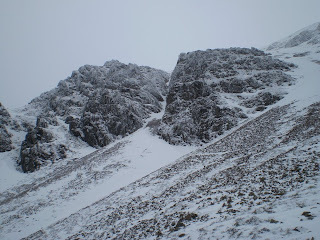 Anyway, so we walked up the path by Force Gill and then, at the foot of the last steep bit, we traversed along till we could see a likely looking bit of steep snow to climb in our crampons. This we did. It was quite steep at the top and just scary enough to get the adrenalin glands doing a bit of squirting. Good experience, though, and if anybody had blobbed off, the run-out wasn’t too bad. I guess it was about three hundred feet or so. At the top, it were blowing a right old hoolie and an attempt at luncheon in blocka/survival bags failed, so we determined to visit the trig on the top and then sod off forthwith. 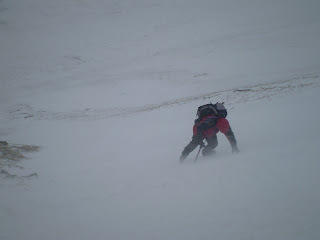 On the way up to the trig, the blizzard intensified into a grade 1 Class A sub class 7 industrial strength blinding blast. 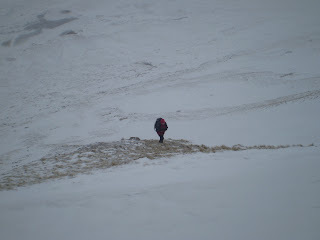 We tarried not at the summit, nor did we attempt a circular route, but put the wind behind us and went down the “up” path. 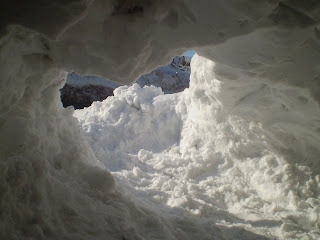 A lunch was had behind a wall and in a small snowdrift at about 500-ish metres. We then sodded off and went home. At home, a further four inches or so of extra snow had come down. Wet, sloppy stuff, though. It’ll all melt. 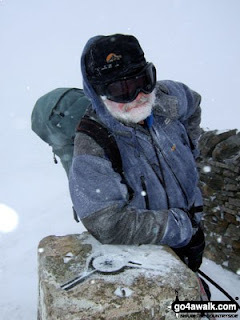 Today’s entertainment started as a result of a short phone conversation with my mate Brian from Nenthead. I arrived at in a sunny but snowy Nenthead city centre just before brunch to the sound of many spades, shovels and those big red plastic snow-shifting thingies. 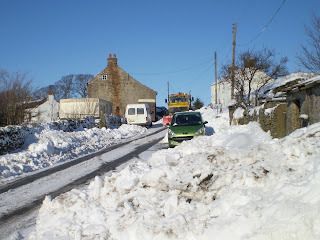 Even the Council was heaving snow over a wall using a JCB. 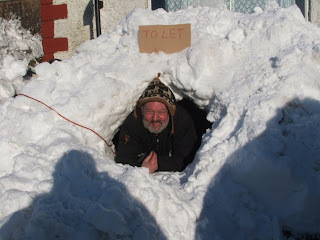 There’s a lot of snow at Nenthead. Any road up, the day was broken up into a series of short games or pastimes. Game 1. Having a rant about the lack of attention from the gritters. Brian was wandering around with a video camera taking pics of the chaos that was Nenthead. He’d rung the gritting people who, for some bizarre reason, seem to be based in Warrington. He threatened them with the BBC. Later, a gritter turned up. You can tell when a gritting service has been privatised. On the first pass they put down the absolute minimal amount of grit possible to still be able to claim they were gritting. On the second pass, they gritted not. Neither did they salt. Neither was their snowplough sullied by snow. They did wave, a bit regally as they went back to the gritting station to return their grit. 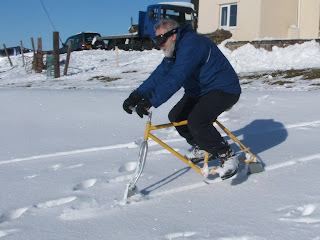 Game 2 Consisted of trying to hurtle down a field full of powder snow on a bicycle with skis on instead of wheels. 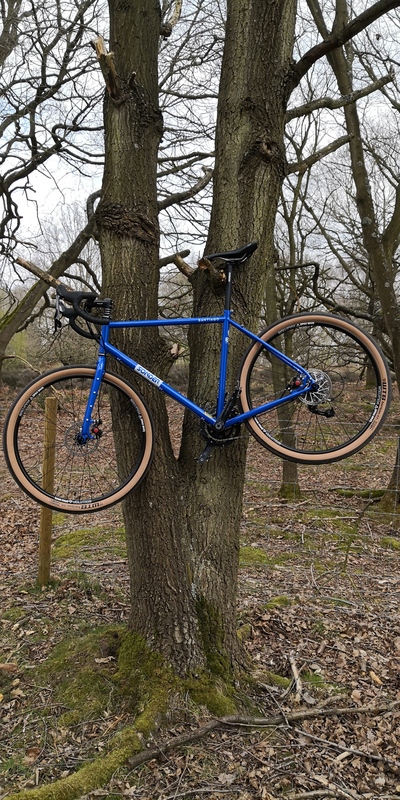 This was very good fun until you had to return the bike to the top. Which was hard work. Nevertheless, several runs were runned. Speed was not involved due to the tendency for the front runner to slide beneath the snow. Some falling off was completed. Game 3 Digging a tunnel into the large pile of snow outside Brian’s house. This took a couple of hours and was interrupted by lunch of some extremely nice soup that Brian had made and a cheese and pickle sandwich. The next door neighbour asked what I was doing. “Digging a hole” said I. We determined to include some fruit cordial in the spray and so, achieve a little pink, orange or red effect. This wasn’t very successful, but was a good idea. Game 4 taking two enormous dogs for a walk in the snowdrifts on the moor. It was whilst travelling to this particular gig that we discovered that the gritters had only, in fact, been performing their act whilst passing Brian’s front door. They had neglected to plough out the drifts on the road, or to deal with the bit where the dustbin wagon had slid off the road a week or so earlier. The walk went well. The dogs bounced around and we didn’t. As there’s been much ado on the news, most of it pretty hysterical, about some snow taking bits of the UK by surprise and giving the people who manage our education system an excuse to order a National Holiday. I thought I’d travel Northern England’s roads for, say, a 160 mile round trip and play in some snow with my crampons at the same time. The results in some ways were a bit disappointing. The A66 was promising with ploughed-up snow walls on either side of the road just a tad over the roof height of the knipemobile. 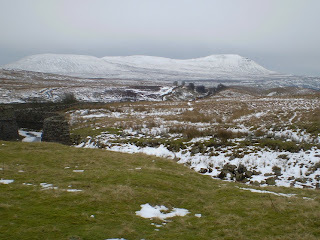 By Warcop, though, the landscape was green and in the Lake District there was just a light covering of fresh snow and some fairly big patches of old frozen snow. At low levels, it was green. I met my brother at the little car park up the hill just outside Braithwaite and we marched off manfully, ice axes swinging in the light breeze to tiptoe up the Ledge route – a way named by that bloke Alf as a more interesting way to get up Eel Crag. 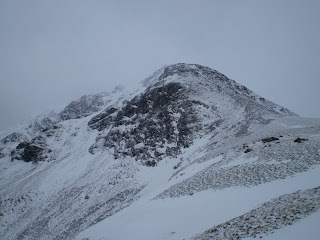 Alf also mentioned an "easy" scramble just next door called Tower Ridge. The route went fairly well for a while and we soon found ourselves floundering up thin snow with frozen plantlife underneath. There were times when the struggle became desperate and just a bit dangerous, so we strapped on our crampons and continued. Somewhere quite close to the top, we bottled it at an exposed steep snow slope and retreated with some difficulty down steep frozen snow for a lunch by an old sheepfold. Plan B was hatched. This involved a diversionary raid on the summit of Grisedale Pike via some lovely stretches of neve and quite a few bare patches. On the way we met Ann and Alvar, my 2008 TGO Challenge vetters on their way down after traversing the hill we were struggling up. Nice to have a little unexpected encounter like this. We had a TGO challenge chat. Grisedale Pike was hard work but uneventful and the path descends to the car park which avoid plodding back up the road out of Braithwaite. The roads home were quiet and fast although I did get gritted three times altogether. We’ll be having another crack at our abandoned route later in the year. Just didn’t feel right at the time. You have to follow your instincts sometimes. 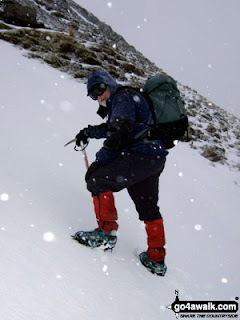 Due to the series of warm winters we’re badly out of practise with the crampon and axe thingy and just remembering how to strap the things on was difficult. 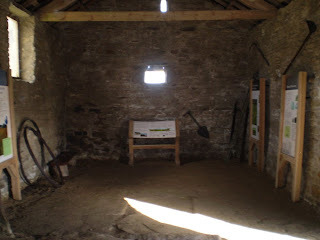 But, if the winter continues in it’s current vein, we should be quite expert by April. Incidentally, a few years ago my old dog Jenny chased a meadow pipit over the crag on Eel Crag. I had to carry her back to the car afterwards. She “fell” about 600 feet altogether and then climbed back up again. Remarkable. Cost me loads of money at the vet’s and I did learn the doggy word for B****X. Is it a plane? Is it a meteor? Is it a black and tan mongrel? And so, following from the previous post, me and superdawg decided to test out the baking on a little trundlette up the Cheviots. We started at Alwinton, mooched over to Clennel and walked up the valley of the River Alwin, which really should be called Alwindale but isn’t. A shepherd greeted Bruno with a kind word and a pat whilst another shepherd had shepherded his family, all on various-sized ATVs for a jaunt up the track. Two little lads (one very little as it happens) were having a bit of trouble making their machines do as they were bid. All good, clean fun anyway. After a bit of forest wandering (I notice quite a few old campfires, chopped trees, broken glass incidentally – not sure who’s responsible for this..) we emerged from the trees high up Allerhope Burn and plodded up the final 100 or so metres to the top. 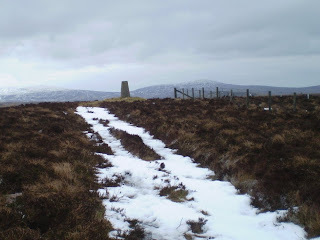 Anyway, our target for today – Wether Cairn at 563 metres was frozen solid. 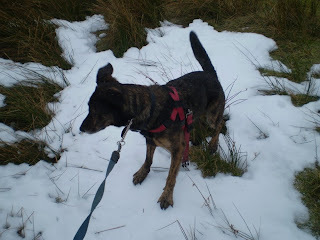 Even the snow was frozen too hard for the dog to stand up on and he was enjoying doing the cartoon-dog-running-away thing. I couldn’t stand up on it either, so I had to walk around some big patches. A few desultory snow showers were just adding a thin coating. We returned across some nice, grassy and downhill moorland (cracking fellwalking) to Puncherton farm and by a permissive path along Puncherton Gill. It were perishing cold all day. The A68 was “interesting” in parts due to the increasing snow squalls.